Shel Silverstein’s fame in creative work begins with the publication of the book “Where the Sidewalk Ends”. The poem “Where the Sidewalk Ends” has become a kind of reflection of the author’s worldview. This work is figurative and at the same time simple. It is about a journey to the unknown, to the world where sidewalks and roads have not been laid yet. To the world where we encounter with nature and our own fantasies. Becoming adult for a person begins with the exploration of the surrounding world. We do not know anything, but we learn, we discover colors, sounds, tastes and smells. Then there comes a period when we get used to what we have already learnt. We change the world around us so that it will become more convenient for us. This is how a person develops. Then at some point we notice that the world has become boring. The reason is that we stop discovering something new. 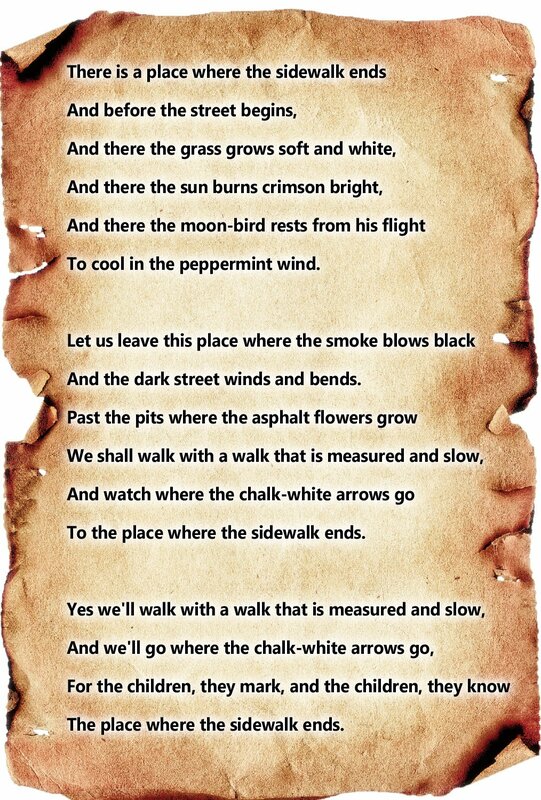 The poem “Where the Sidewalk Ends”, as if addressed to children, is actually intended for adults. Adults who have narrowed their world to asphalted roads filled with black smoke. It’s time to take a piece of chalk and draw arrows so that they will go beyond the boundaries of the usual. And follow these arrows. The world that is familiar to us is quite convenient and predictable. We know everything about it, or we think that we know everything. And exactly because it is habitual to us, we sometimes do not notice that this convenience is very costly. We breathe in “black smoke”, our knowledge is limited. The author sees this inaccuracy of life and suggests … going outside the sidewalk. It is strange but the rhythm itself is more like in a children’s poem. It was due to this rhythm that this work was initially defined as a work for children. However, for the time being, children do not know how dangerous the restriction made by this sidewalk is. Therefore, despite the playful rhythm, it represents a contrast between the cheerless “here” and the enchanting “there” ‒ for adults. What is There, Outside the Sidewalk? The author suggests that we should think what expects us beyond the usual, where the sidewalk ends. Will it be a yard of a big house, a farm or a magical place where there is nothing familiar to us? But there is no mysticism. There is nature extending in front of us. The soft grass there is for some reason white. Why white? Maybe it is reflected light which makes it even more attractive. You know it would be great to lie on such grass. The sun is red there, and it scatters pink gleams over the clouds. The red sun is the sunset. At this time it is not hot, but still not cool, and the temperature is the most comfortable. And the colorful clouds give the place where the sidewalk (and time!) ends a special charm. Here for the first time we come upon a hint that the world described by the author and where he invites us has not only a dimension in space, but also in time. And in this case the road that goes on outside the sidewalk immediately assumes a special character ‒ it becomes a symbol of human life, a symbol of time. The author keeps on fascinating us. “And there the moon-bird rests from his flight To cool in the peppermint wind”. An amazing bird? The wind with the smell of peppermint? All these things contrast strongly with what we are used to seeing in the world where the earth is hidden by the sidewalk, and the growth of grass is kept within certain limits by lawn mowers. “Past the pits where the asphalt flowers grow”… Yes, to see the flowers in the pits and cracks in the asphalt layer means to catch the distant, almost illusive smell of the wind, not the black wind of the city. The wind with the smell of peppermint. The very smell that entices us to follow it, “walk with a walk”. As if our steps are impressed into the asphalt so as to feel the elasticity of the earth and the softness of the grass. “And watch where the chalk-white arrows go”, it means at least that we have hints which will help us along the way. The way that we are sure to pass.